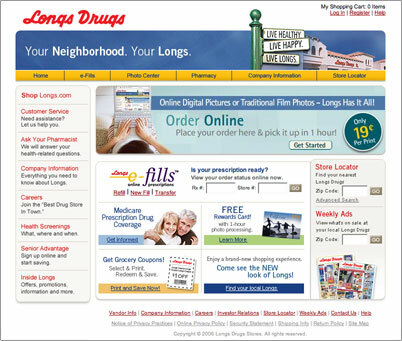 longs wanted a site redesign, and to get their new message across - 'live healthy, live happy, live longs'. the home page was designed to make it easier for the user to navigate the entire site and find what they are looking for. drop down nav menus and a left hand navigation were added, along with a flash area for the 2 main sections that longs wanted emphasized - online photo & pharmacy.